Dr. Nicole Delpeche-Ellmann is currently a scientist at the Laboratory of Waves Engineering (LWE). She has a combination of both ocean science and industry related experiences. Her main expertise includes designing and executing field experiments (over 15 year experience) for the development of mathematical and environmental solutions. She has diverse marine research interests that vary from coastal upwellings, Lagrangian transport, mixing in stratified environments and internal waves. 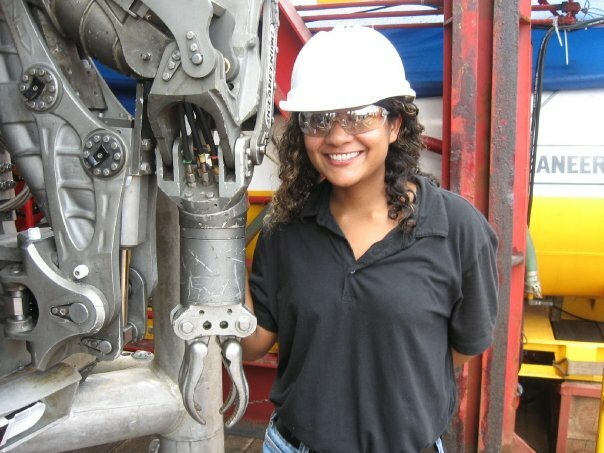 After completing her undergraduate degree in Geodesy and Land Information (previously Surveying and Land Information) at the University of the West Indies (Trinidad) she proceeded to obtain valuable oceanographic field experience by working with an internationally recognized oil and gas surveying company by performing both offshore hydrographic and coastal surveys. She them furthered her marine expertise by pursuing a Master’s of Science in Ocean Mapping from the University of New Brunswick, Canada (under the supervision of Prof. John Hughes Clarke). It is here that she gained coastal oceanography experience related to mixing in stratified environments, internal waves and sedimentation. Following this, she proceeded to work in industry as a party chief oceanographer/hydrographer for an environmental consultancy companies and for various oil and gas surveying companies. In 2008 she moved to Estonia and joined the LWE at Tallinn University of Technology. It is here that she pursued her PhD (under the supervision of Prof. Tarmo Soomere) on the subject of Lagrangian transport and its application to marine management. On completing her PhD she continues to work at the LWE. Her research experience at the LWE along with previous field experiences has equipped her with the expertise, tools and network of utilizing mathematics and statistics for an even deeper understanding of the ocean that can be utilize for efficient marine management. Delpeche-Ellmann, Nicole; Soomere, Tarmo; Kudryavtseva, Nadezhda (2018). The role of nearshore slope on cross-shore surface transport during a coastal upwelling event in Gulf of Finland, Baltic Sea. Estuarine, Coastal and Shelf Science, 209, 123-135. Delpeche-Ellmann, Nicole; Mingelaitė, Toma; Soomere, Tarmo (2017). Examining Lagrangian surface transport during a coastal upwelling in the Gulf of Finland, Baltic Sea. Journal of Marine Systems, 171, 21−30.10.1016/j.jmarsys.2016.10.007. Delpeche-Ellmann, Nicole; Torsvik, Tomas; Soomere, Tarmo (2016). A comparison of the motions of surface drifters with offshore wind properties in the Gulf of Finland, the Baltic Sea. Estuarine, coastal and shelf science, 172, 154−164.10.1016/j.ecss.2016.02.009. Delpeche-Ellmann, Nicole; Torsvik, Tomas; Soomere, Tarmo (2015). Tracks of surface drifters from a major fairway to marine protected areas in the Gulf of Finland. Proceedings of the Estonian Academy of Sciences, 64 (3), 226−233.10.3176/proc.2015.3.04. Delpeche-Ellmann, Nicole C.; Soomere, Tarmo (2013). Using Lagrangian models to assist in maritime management of Coastal and Marine Protected Areas. Journal of Coastal Research, SI 65, vol. 1, 36−41.10.2112/SI65-007.1. Soomere, Tarmo; Delpeche, Nicole; Viikmäe, Bert; Quak, Ewald; Meier, Markus H.E. ; Döös, Kristofer (2011). Patterns of current-induced transport in the surface layer of the Gulf of Finland. Boreal Environment Research, 16, 49−63.